Apply the Climate Brakes Now! The recent IPCC report by the world’s leading climate scientists gave us a clear climate Stop Sign. The report said that to keep the increase in global temperature safely below 1.5 degrees Celsius, we must reduce global greenhouse gas emissions 40 to 60 percent by 2030, and reach net-zero emissions by 2050. Beyond these tipping points it is almost certain that we will plunge off the climate cliff into an unlivable world where powerful natural feedbacks will be unstoppable. Taking action to reduce our emissions is like applying the brakes in a car. To stop the car in the shortest distance possible the brakes must be strongly applied but skidding must be avoided. We must quickly make major emissions reductions and increase the reductions over time and we must avoid major delays and setbacks. How can we apply the climate brakes without skidding? The IPCC report recommended carbon pricing as the best way to accelerate emission reductions. The vast majority of economists have also identified carbon pricing as the most powerful climate policy tool available. “I. A carbon tax offers the most cost- effective lever to reduce carbon emissions at the scale and speed that is necessary. By correcting a well-known market failure, a carbon tax will send a powerful price signal that harnesses the invisible hand of the marketplace to steer economic actors towards a low-carbon future. “II. A carbon tax should increase every year until emissions reductions goals are met and be revenue neutral to avoid debates over the size of government. A consistently rising carbon price will encourage technological innovation and large-scale infrastructure development. It will also accelerate the diffusion of carbon- efficient goods and services. The U.S. can implement this policy now. The bipartisan Energy Innovation and Carbon Dividend Act (HR 763) has been introduced in the U.S. Congress. It is a national revenue-neutral carbon fee-and-dividend plan based on the principles in the “Economists Statement” above. Implementing this policy in 2020 would reduce U.S. emissions 40 percent by 2032. The U.S. can lead the transition to clean energy. We can inspire other major emitting countries to adopt similar carbon prices. This would achieve the majority of reductions needed to meet the IPCC goals. Global carbon pricing would also make it much easier to achieve additional emissions reductions with targeted policies at local, national and international levels. Support HR 763. 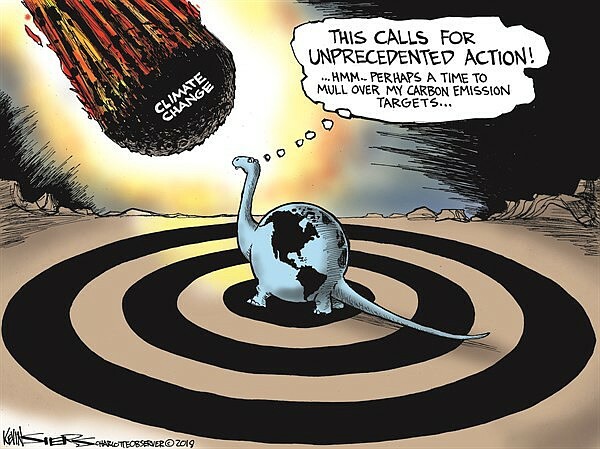 Let’s apply the Climate Brakes Now! John D. Kelley is group leader of the Santa Barbara Chapter of the Citizens Climate Lobby.